Lufbery's Nieuport 17 was armed by both a non-synchronized Lewis machine gun on the top wing and a synchronized Vickers machine gun atop the cowl. Lufbery was known to inspect and polished each bullet in his gun's drum to help avoid the frequent jams for which the Lewis guns were known. Norman added a trigger cable made of .007" Detail Master wire and painted both machine guns with Floquil Weathered Black and dry brushed with Floquil Gun Metal. The seat back provided in the kit was painted with Floquil Earth and covered in Gunze Clear Orange to represent varnished plywood. Norman fabricated the button-tufted seat cushion from shaped styrene and painted it with Floquil Earth, Testors Leather, and Gunze Clear Red, topped with Aero Master Flat Clear and a light gray wash to bring out the details. 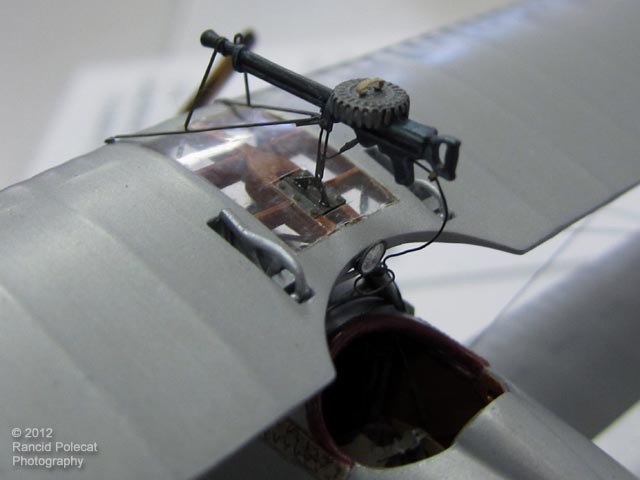 Added cockpit details include: canvas panel behind the seat with cross brace wires and photo-etch turnbuckles, lower cross arms added to the control stick for aileron control linkage, control lines from the rudder bar, and aluminum and copper wire for gauge cables.